Before I get to the race report I'd like to give a toe update! Thanks for all the advice. I did soak it in bath salts (thanks Gazelle) and I did try to drain the rest of the blister...I also bought new shoes. My love affair with Mizuno is officially over, I'm on board the Saucony train. Toe is sore, especially after today's soggy race but I think the new shoes are helping. Friday I slept in and headed out for a post work 5.5 miler. It was gorgeous on Friday. I ran in my cheetah pink running skirt and a long sleeve top and wasn't cold. I did 4 miles by myself, I purposely took a hilly route than normal since I knew the Shamrock run was going to be a tough course. I grabbed the dog for the last 1.5 miles. 5.5 miles - 57:00 - 10:21 AP The shoes felt great and I was thoroughly enjoying the sunshine and warmer temps. Saturday I spend the day with "Junk. "* We had planned to pick up our race packets and do some living room yoga but ended going shopping and eating burgers instead (way more fun)! I woke up at 5:45ish to the sound of hard rain and fierce wind. My first thought was--SERIOUSLY???!!!!! Mr. Pi and I got geared up and headed downtown for our wet, cold, hilly race. A bunch of other bloggers were running too but with the weather and the crowds we only saw Sarah. However, we did see this girl speed by in her triumphant 5k finish...AND I ran into HTC leaving the post-race festival area. Poor Gazelle's is home with the flu! These two were there but I didn't see them. So was, one half of this team. Anyway, it was pouring down rain, windy and cold. I knew the course was going to be tough but I had a good attitude about just wanting to finish (secretly hoping to stay under 11:30 miles despite the ~1300 feet of elevation gain). 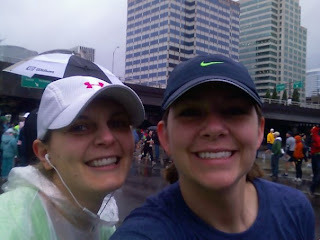 Here is Sarah and I at the start. Yes, I ran in a poncho! I swear it helped keep me dry. The buzzer went off and we were on the streets of P-town in no time. (Actually, 3 minutes or so past the buzzer). My strategy was to NOT walk until mile 3ish. I succeeded and actually felt great on the first few "speed bumps." As soon as we wound our way up Terwilliger I implemented the walk/run strategy. I kept this up until mile 5ish when we hit the downhill. This is the first race I've ever managed negative splits! My slowest mile came in at 12:15 and my fastest at 9:45. Miles 5-9.3 (9.65 according to G) were all at 10:45 or better...averaged around 10:15! The first 5 miles (except mile 1 which was flat) were all above 11:00! According to G, 1:45:05- 9.65 miles - 11:06 AP. Who knows what the official results will say...I'm thinking slower since G says I ran an extra .35 miles. I met my "secret" goal and felt pretty great at the finish other than getting cold very quickly! I have three weeks to prepare for my Half Marathon. I have a very ambitious goal, which I'm not ready to post yet, BUT the course is flat and Julianne has said she'll help pace me, so I'm hopeful. Big shout out to all the many racers today! I hope that everyone had a great race and I'm looking forward to reading all the race reports. I know many of you PR'd! *We were laughing yesterday about how a lot of bloggers refer to me as The Ambitious One or something to do with my blog title and how Sarah is glad no one has called her "Junk"...well sista, someone just did =).